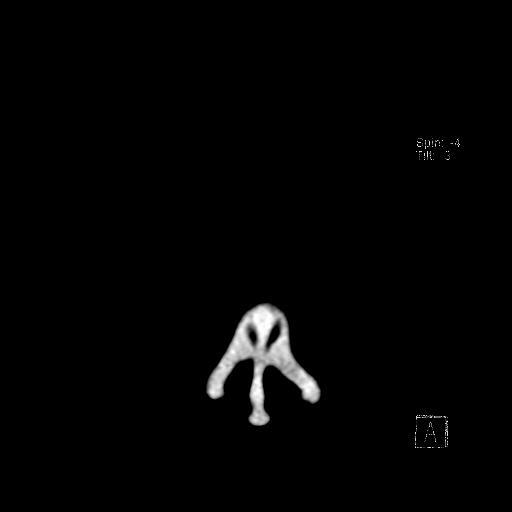 The CT images are possible only because of knowledge about physics instrumentalized through sophisticated hardware and software and applied in the service of clinical intervention rooted in the best of our medical knowledge about the inner workings of my head. “CT” stands for computed tomography. The process relies on the differential passage of x-rays through parts of the body to reveal interior structures of varying density. This is the same idea as your classic x-ray imaging of a broken bone. 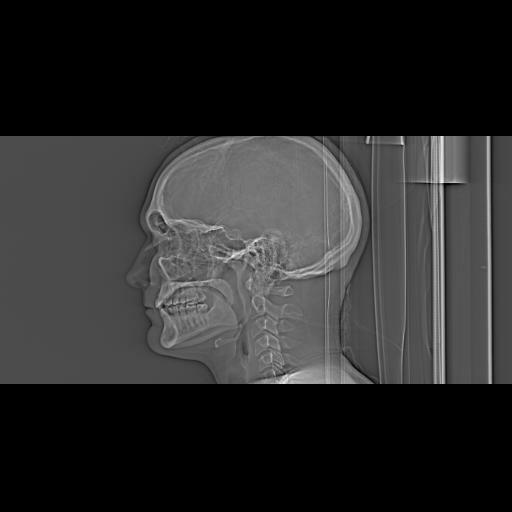 However, the finer grade detection coupled with computational processing of the resultant data allows for the creation of CT images at specific cross-sections throughout the body. 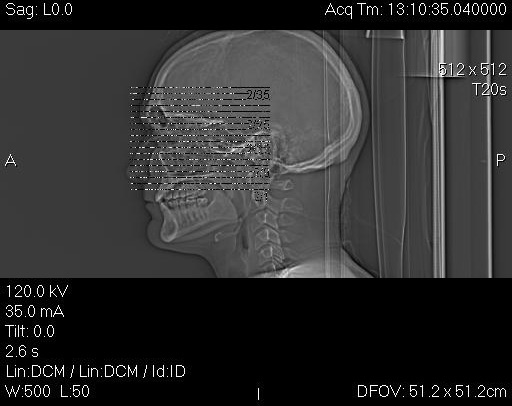 The word “tomography” derives from the Greek word for “slice” (tomos) and combined with “to write” (graphein). 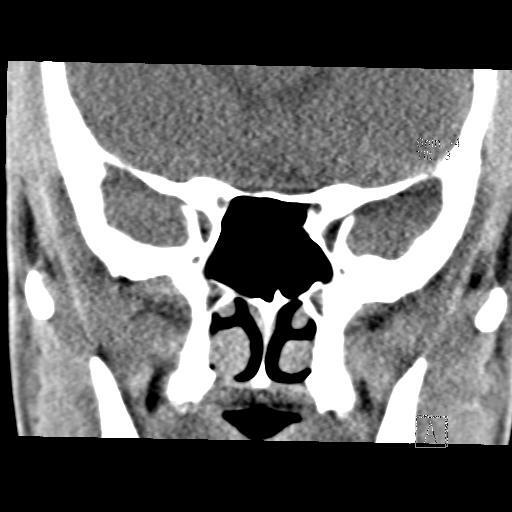 The slices produced by CT open a window into the structures of the body in their exact alignment – or misalignment, in the case of my septum. Most of the people I have shown these images to share my interest, and some my fascination. Though it was curious to find that one fellow found the whole thing quite off-putting. He said it was “dehumanizing.” Incidentally, it was the same fellow who denies global warming and prides himself in a “simple” worldview of theologically endowed libertarianism. The embodied self revealed by these images is too squishy, too organic, too complicated, too contingent. I say bring it on. I find it totally humanizing, insofar as it reveals to us more texture of the human condition. Our sense of vision evolved in an environment lit up by the electromagnetic spectrum emitted by the Sun, which happens to be dominated the band of spectrum we now call visible light. We don’t need x-ray vision to navigate the world we live in. Moreover, it would probably be maladaptive for us to perceive the other cosmic rays bombarding our retinas. But marshaling other parts of the electromagnetic spectrum for other applications has proven most useful, from wireless communications, to microwave ovens, to tanning salons. In the case of CT, we use electromagnetic waves with higher energy, greater frequency, and shorter wave length than those visible to us. These “x-rays” penetrate the depths of our bodies and, with the help of technology, produce images that can be perceived by our retinas. Such that I can have nerve impulses traveling through my optic nerves right now that signal to my brain visual perception of those very optic nerves. Amazing. 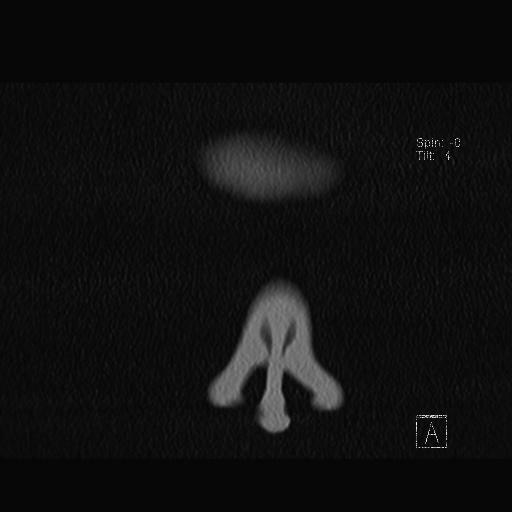 Of course, my CT Scan was done not out of curious awe, but targeted intent to document my misshapen nasal passages with the hope of surgically correcting that situation. The images produced of these slices appear as if you were looking at my straight in the face and then I tilted by head back 90 deg. so that you were looking through my chin toward the top of my forehead. Hence the left side of the image is actually on my right and vice versa. 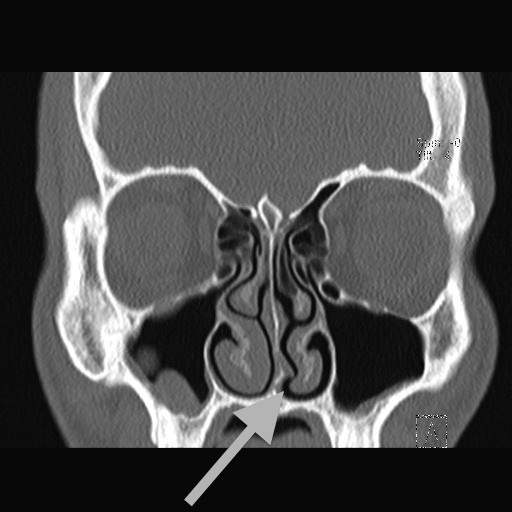 The prime targets of all this imaging were my septum, which divides the nasal passages leading back from each nostril, and the turbinates, which are fleshy structures capable of expanding and contracting to divert the airflow around them. My doctor already knew the septum was deviated and that inflammation of the turbinates was the cause my chronic congestion. 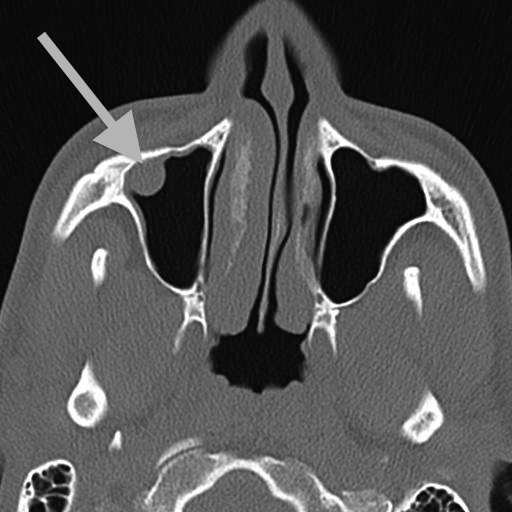 The CT scan confirmed that, specified how, and also revealed a third problem: disease of my right maxillary sinus. 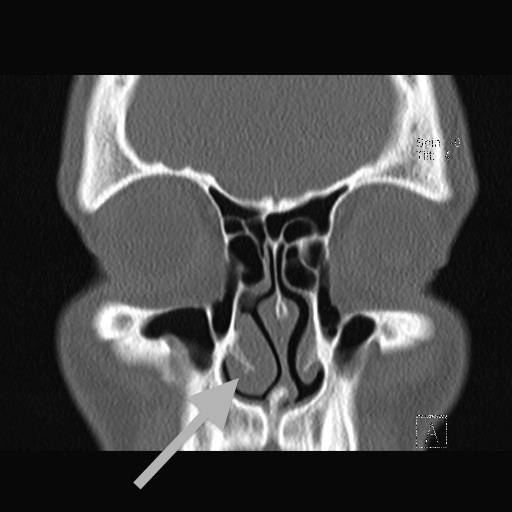 Seen laterally here, my septum used to deviate to the left (remember the sides are switched because it is as if you were looking up at the slice from below). My doctor corrected these deviations by conducting a septoplasty in which the septum was sliced up and reset. I currently have temporary plates on either side of my newly situated septum. They will be removed on Tuesday. The discomfort is far more tolerable than I expected. The deviated septum was a problem in part because of its interaction with the turbinates, which, when inflamed, block air flow, thereby restricting my breathing. 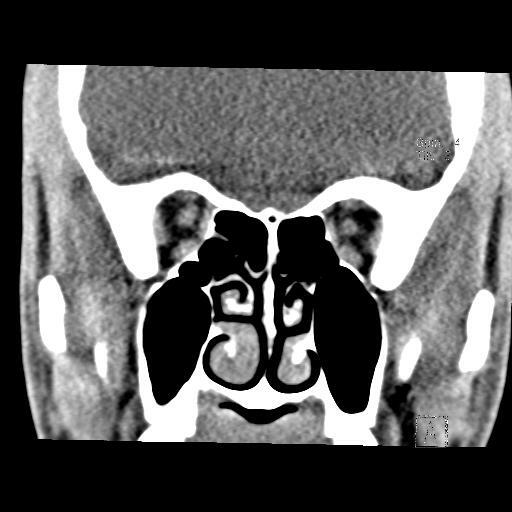 As the CT images show clearly, my turbinates were quite asymmetrical with the right inferior turbinate being significantly larger than its counterpart. I presume that both “turbinate” and the alternate name “nasal concha” refer to the coiled shape here, like a turbine or a conch shell. 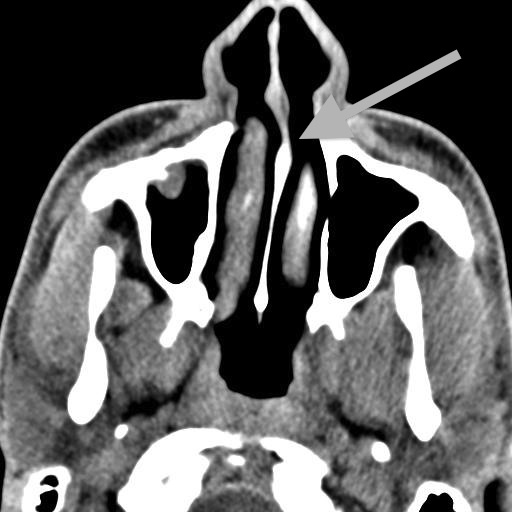 Working together the turbinates channel airflow through three primary paths in each nasal passage: below the inferior turbinate, between the inferior and the middle turbinates, and above the middle turbinate. 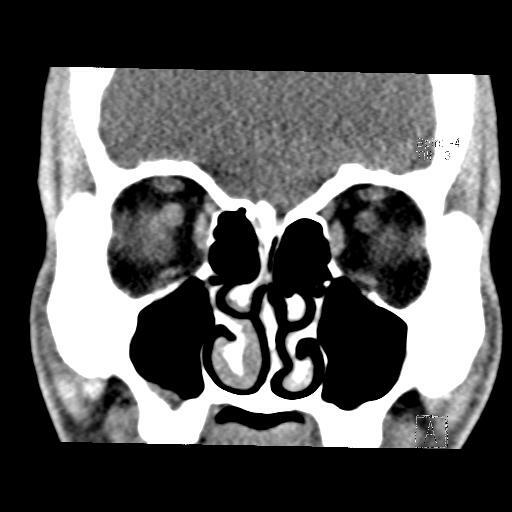 The surgery included a turbinoplasty to shrink the turbinates, particularly that pesky right inferior one. Now this is wild, the method used for this procedure was radiofrequency ablation. Yet another band of the electromagnetic spectrum was used — here for material effect. Just as microwaves can be used to vibrate the bonds in water molecules in your food to heat the food up, particular radio waves emitted by probes can zap the tissue of the turbinates in a way that causes parts to crust over and, as they heal, shrink down. This should allow for less restricted airflow through my nasal passages. Before the CT scan was conducted, we expected to see a deviated septum and funky turbinates. 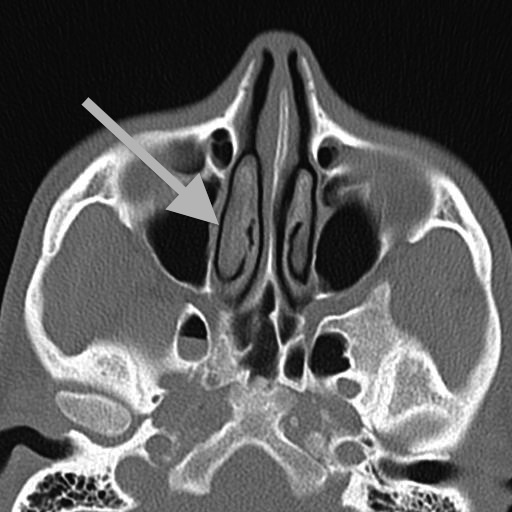 But an unknown was also revealed: unwelcome matter in my right maxillary sinus, the cavity behind my cheek bone. I still don’t know what this gunk was, but most likely a polyp or overgrowth of the mucous membrane. Once this was revealed by the CT scans, my doctor added “antrostomy” to the list of interventions included in the surgery. 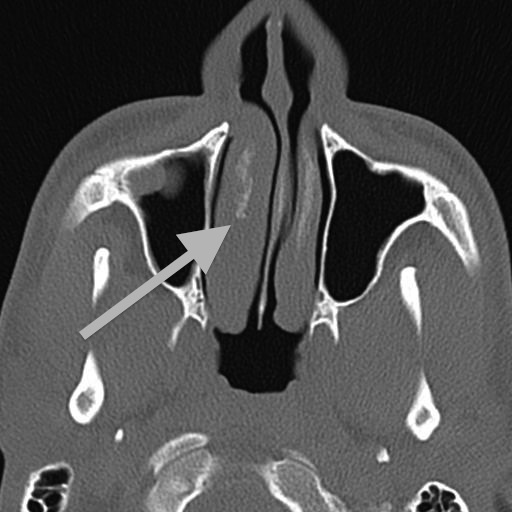 While slicing and dicing in my nasal passages, he took a detour into my right maxillary sinus to dig out the gunk. With those three interventions done, I am now in recovery mode. The plates come out tomorrow. And then I will have another couple weeks of gradual healing. Hopefully the legacy of all this will be better breathing – particularly at night resulting in more restful sleep. In any case I have all of these images of the inside of my head. 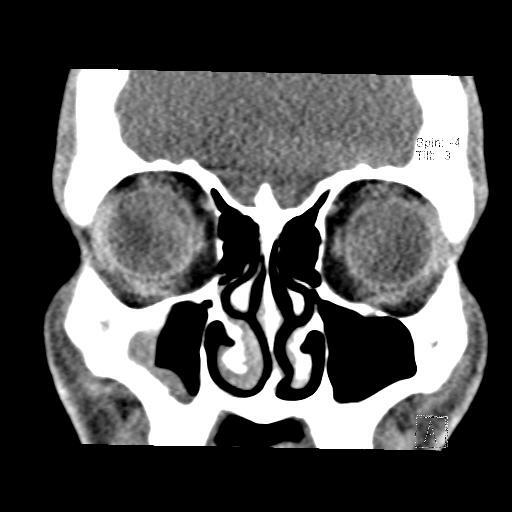 Some of the images from the front resemble space invaders, starting from the tip of my nose and then beaming up to the mother ship of my forehead with its crazy asymmetrical frontal sinuses. Glad to hear that your surgery went well enough and that the matter removed from inside your head was immaterial to your to continued production these blog posts. The images were quiet revelatory, too. Perhaps you could get a set for Krugman’s head? 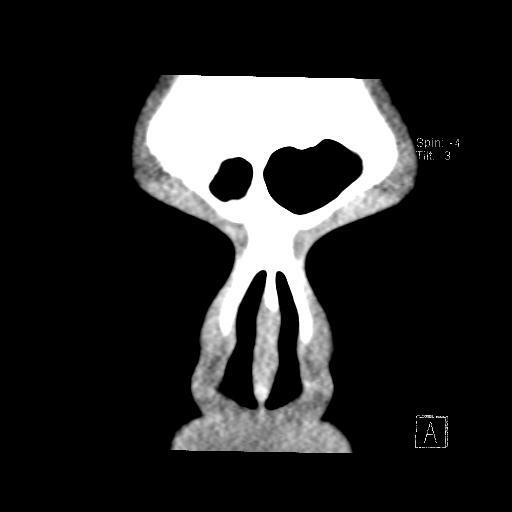 I appreciate how you managed to bring a human element to technical black and white x-ray images. It DOES tell us something about the human condition. I hope you breath easier now. incredible, really. btw, what doesn’t intrigue you? this entry is way cool. thanx! Ok you’re hilarious. The sea-unicorns cracked me up. Also, I just got a CT and was looking at my images last night (my follow-up is Tuesday) and hoping to see a polyp or something obvious as the source of my mild but never-ending discomfort. 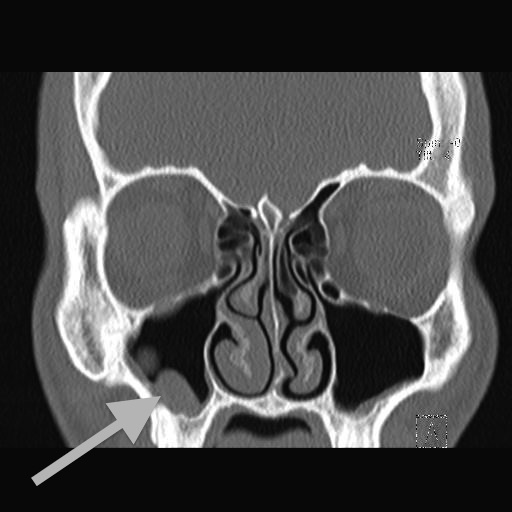 All I saw that seemed obvious was the inflamed right turbinate, just like yours! 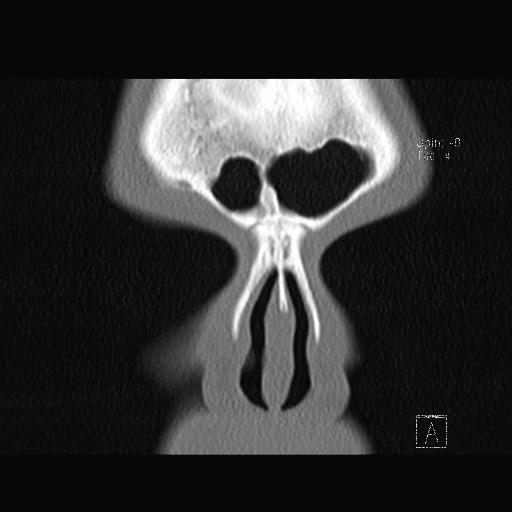 The ENT said I had a deviated septum but I have no idea what caused all the issues. It’s nice to find a detailed description of a situation similar to mine – not too excited about the prospect of surgery but maybe that would fix the problem, eh? Hello I’m fascinated by this as I’ve recently been diagnosed with similar!